The PCB-1000 is completely portable and is powered by a 18Vdc Dewalt type power tool battery of the Li-I or NiMH type. 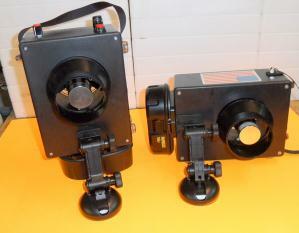 The unit measures 3 x 8 x 6 inches plus the battery length approximately 2.5 inches. The unit weighs a maximum of 3.65 lbs with the largest battery. The output CFM is rated at 110 CFM into a 3 inch hose and life on a single charge is as much as 4.5 hours. 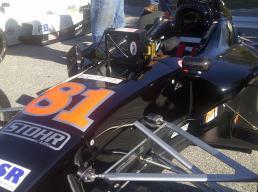 Pricing: $245.00 with 3.5 AH NiMH battery or $195.00 less battery. DeWalt (TM) batteries are available at your local retailers where power tools are being sold. 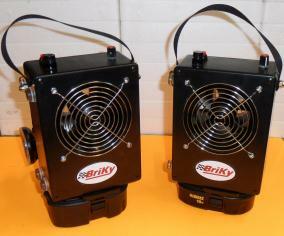 Briky Inc., sister company of ElecMech Inc., uses brake cooling blower technology from its expertise in the Nascar Sprint, Nationwide and Truck racing series to build portable cooling blowers for cooling race drivers, race mechanics and race pit personnel during hot races. 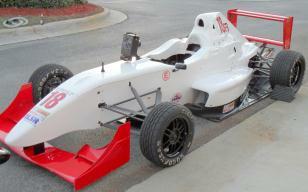 The PCB-1000, Personal Cooling Blower, is being used in the new F1000 SCCA racing competition to keep drivers cool and comfortable while sitting on the grid preparing for racing.